Share this product and receive a $0.44 sharing discount. It's an exciting day-Trusty is moving! He'll attend a new school and meet new friends! But when big Bully Blare teases his new friend Missy, Trusty must make a decision. He soon learns what it means to be a true friend. From Courtney of Rhome, Texas on 1/9/2013 . 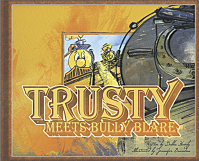 Trusty Meets Bully Blare is yet another great addition to this lovable series. My boys love these books. They are the perfect way to teach a sweet, valuable lesson to a busy young boy (or girl) in a way that is both memorable and enjoyable. Please keep these coming! We will buy every one.